*This post contains affiliate links and an FCS team member may be compensated if you make a purchase after clicking through a link. 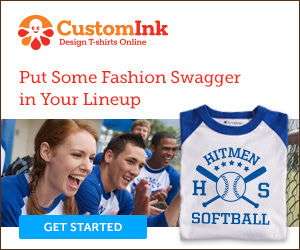 Tis the season for soccer, softball, summer bowling leagues, etc., – why not create custom apparel at CustomInk? You design. They print. They ship. And – shipping is FREE on two-week standard delivery. CustomInk guarantees that their shipment will arrive at your door within 14 days. Shirts aren’t all you can create. Get baseball hats for Earth Day walks and runs, team-wear and jerseys for office softball teams! Design your own custom t-shirts at CustomInk.com and get free shipping now! Check out hoodie design ideas from CustomInk. Use CustomInk to customize and create t-shirts for your group charity walk or run event! Check out Ink of the Week where each week, CustomInk rewards the customer whose photo shows the most group spirit through a photo contest.